One lucky Mom Endeav­ors reader will win a $100 gift card to Lowe’s!! Use the Raf­fle­copter form below to sub­mit entries. To enter, click the but­ton that says, “Do it!”, and then com­plete that spe­cific task. Each time you do this, you get one entry. Then con­tinue on, and do as many (or as few) tasks as you like. ONE LUCKY WINNER gets the gift card! For even more ideas, visit Lowes Creative Ideas . While you’re there, you can sign up to receive their free Creative Ideas Magazine, which is full of all kinds of ideas & inspiration! « Halloween lunch with ghost sandwiches! We are redoing our basement! 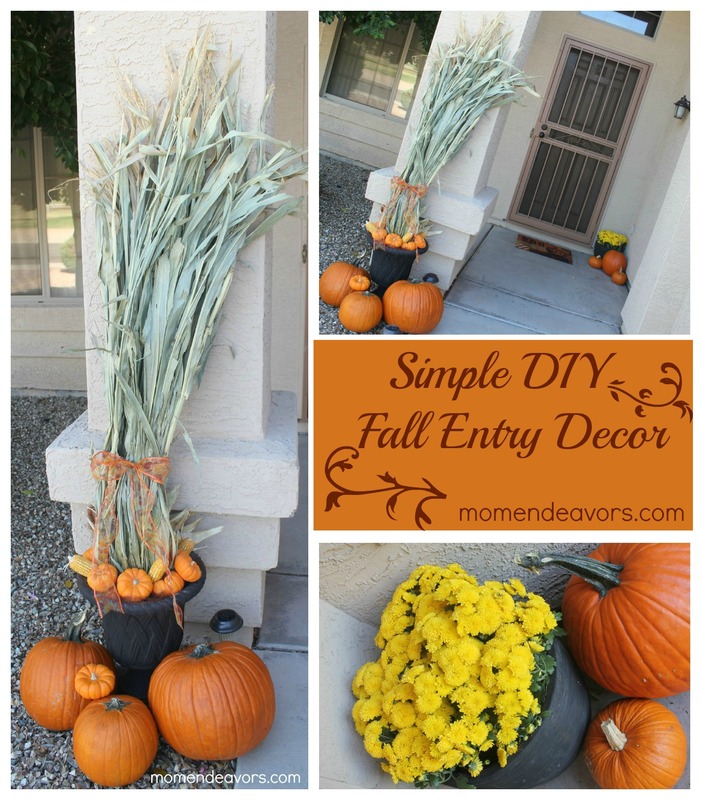 i always try to decorate my front door area but i never know what to do! this is so perfect! love it! I love decorating for the holidays! Our budget has been so tight that all we have this year is a little white pumpkin, so a gift card to Lowe’s would go straight into making our place more festive! I would extend our front patio – more room to decorate AND spend time with friends and neighbors! Garden and get another box garden so I can plant more. I would buy shelving for our garage. Ohhhh, I would love that gift card! I’d most likely buy paint to freshen up my front porch furniture plus some outdoor decor! I need to “fall” up my front door area. I also need some planters. I am looking for planters that look like your, Taller and black. Thanks for the chance . I would buy some paint and accessories for the boys’ room! I would buy fall decor stuff! or Christmas lights! I would buy some new Christmas decorations in bright and sparkly colors. Such cute ideas, yet so simple! I would buy paint for my front door, mums, and pots for garden containers! I’d love to buy some fall decorations for outside. Mums are great for pops of color! Supplies to build a shelf. A rug for the living room! I would purchase home organization items – totes, compartments or dividers fro drawers and closet organizers! I think I’d buy primer and paint. I would buy an interior door. I need a new door for my closet. I would love to surprise my husband with a drill that he has been wanting – then he can do some projects I have been thinking about! I’m always in need of paint! I think I would do some sprucing up in my master bath we need new light fixtures!! We’re working on replacing old wiring in our house, so any supplies for that are greatly appreciated! Knob&Tube wiring is kind of scary! I would use the gift card towards a new countertop for my kitchen. Something for my husband…that’s for sure! Our house is in some serious need of paint in the livingroom. I want mums, and a hammock for my yard!! I actually need a broom or a rake and then I would like to get one of those Terracotta Clay Chimeneas. I would like to buy some Vinsser Primer, Paint, sponges, and brushes for a table and chair project. I need a new table…but until we can afford that, I will re-do the one we have! 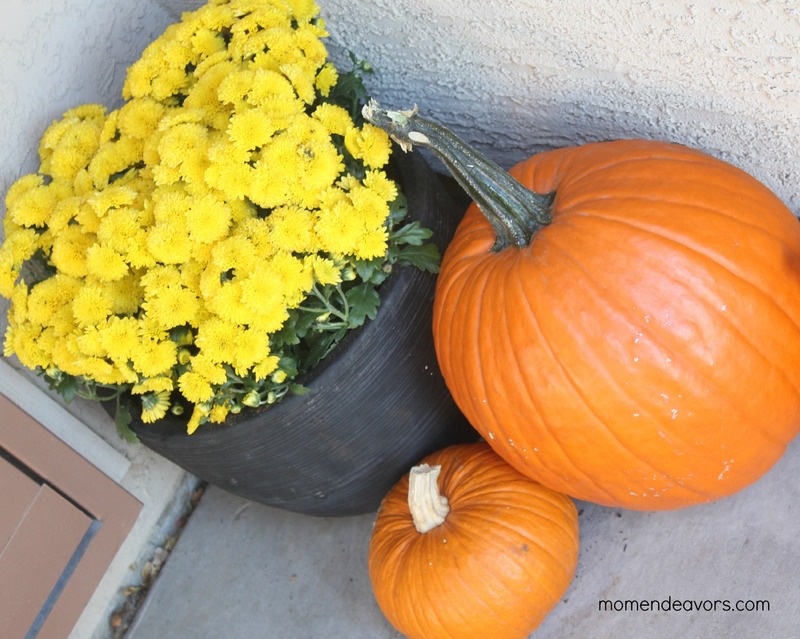 I love the fall decor from Lowes – it certainly will carry you into Thanksgiving and give a warm fall welcome! As far as the gift card, we have a number of fall projects but getting a vapor barrier down in our crawl space is priority. Our daughter suffers from allergies and asthma and I just learned recently that Lowes has a durable product to put in our crawl space that might help reduce allergens in our home for her. It won’t be pretty like your lovely project – in fact no one will see it, but it would be a huge to help our family. Flooring for my son’s room! Flooring paint for the patio area! I am dull and my gift card would go towards home improvement! I would buy decorative window film. i would start a garden! I would love to put it towards a new front door for my home! I had some carpet put in years ago and when they were removing the old carpet, they took of the decorative molding on the front of my door. It broke and they never replaced it. I would love a new front door that looks nice! I would buy new light fixtures! Paint for the living room. If only I could use the gift card to get some painters…. I’d buy paint for my son’s bedroom! 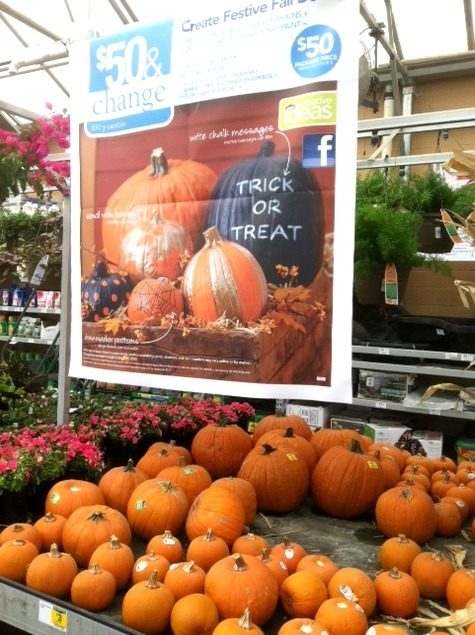 Fall decorations and some mums for sure! Love them! I would buy fall decorations too! Paint! We bought a 1950 home 4 months ago that is in desperate need of a paint job. Christmas lights! We’re planning to go all-out this year! I would get some paint to decorate my daughter’s bookshelf and bed frame. I would put it towards carpet! I would get some paint and curtains. I would buy our favorite Red Max garbage bags and new window blinds!! we need blinds desperately! I would buy paint to revamp our dull white walls. I’ve have been carefully planning (in my mind) a makeover for my bathroom. I’d like to refinish the cabinets and put some hardware on them! 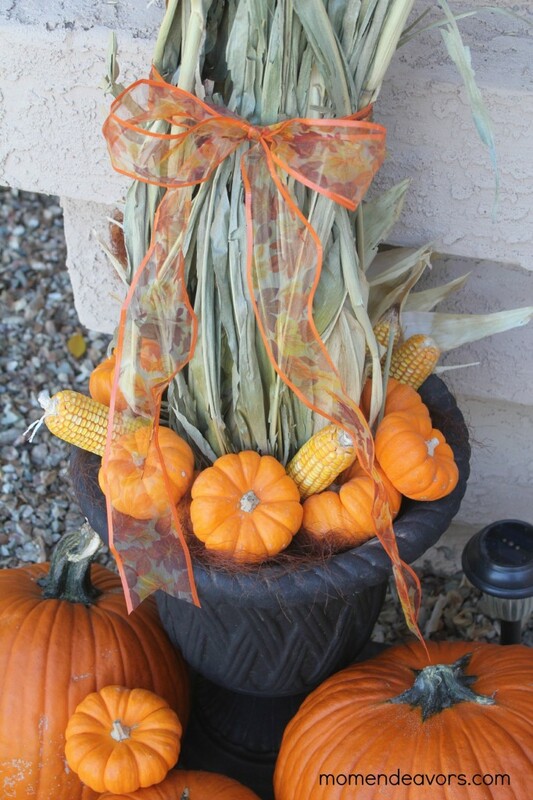 Love your fall decor…great ideas! A new artificial Xmas tree. A new sink.. I hate my white enamel one! Get things to make our house look like a home! I try to add a bit of something! Love those cornstalks! Thanks for the chance!! We desperately need to repaint our walls! I was so suprised with their selection! It had been a few years since my last expetience with them (it was negative) but i was so pleased this time! I cant wait to check them out further! I also got the cornstalks, for a steal at 6 bucks! Oh and i would buy a pedestal vanity for my tiny bathroom! The vanity in thereis way too large for the space! I would buy flowers for my backyard and new sand for our sandbox! How exciting, hope I win! I’d love to remodel our bathroom!